It is very easy to get stuck in this map. 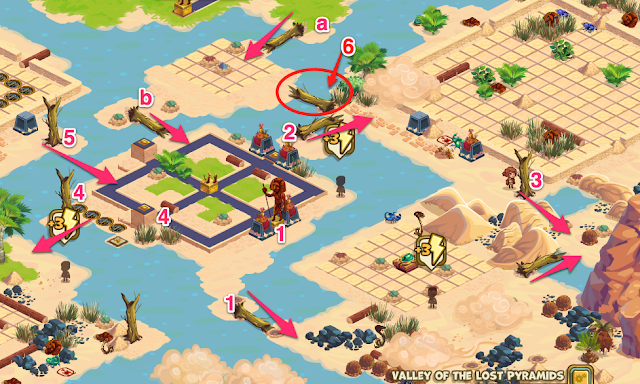 Here are some tips to help you to go back, if you missed one or more of the statue pieces. Chop ALL the Dead Trees you can find! They will give you a way back. When the statue is here, you can always push it from this side. Chop the dead tree at this place and then go to the right of this image to chop a dead tree also there. Added this new one by Zynga, so you can always come here, for not getting stuck. In this way you may be able to move statues from the sides 2 and 4, and reach those places. If you didn't chop all these trees down, and you didn't collect all the statue pieces, then contact Zynga Support. any idea how to get the vent down from the mountain? it looks like the one part will lower to get to the vent but i have no idea how...thanks! When the 3rd statue is placed in the main square, stairs will come up, so you can reach the mountain.